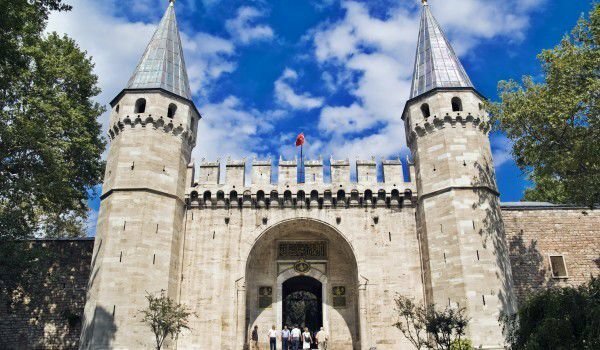 Topkapi Palace ор Sarayi Topkana is one of the foundational palaces of Turkish Chambers, which were established for the administration of the Ottoman Empire. This delightful complex was built on Cape Seraglio which is the east end of Old Istanbul. Located between the Golden Horn and Sea of Marmara from Topkapi there is an amazing view of the Bosphorus. Topkapi Palace has three doors: Bab-uh Hyumayun, Bab-yus Babyu-salaam and the main door, there are four courts, large garden (Gyulhane) and other gardens. Today you can enter through the middle gate, which leads to the second courtyard. The three sides of the Topkapi Palace is surrounded by marine waters. The sea walls are the build of the palace, and the siege on the land walls are 1400 meters long. Built on an area of 700, 000 square meters, the palace consists of three main parts - Biruni, Enderun and Harem. Fatih built first the residence then the palace and called it the New Palace. Only in the 19th century, it has been called by the name of which it is known by today. The Byzantine fort Topkana was built on stones and columns remaining from the palace and the Byzantine palace reservoir was kept. In the garden of tulips there is also a christening bath which has been left over from the Byzantine period. This fact is a positive indicator of the Ottoman power had cultural heritage over its predecessors. The library Topkana Sarayi has 22, 000 handwritten books. This enormous paper wealth is composed of works not only in Arabic, Persian and Turkish, but the Slavonic, Greek, Armenian, Latin and even Hungarian language.